Smoking was very fashionable during the Victorian era. Cigars and pipes were more popular at the beginning of the period, but prerolled cigarettes took over in the 1880s. 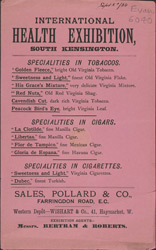 Because of import taxes foreign cigars such as those advertised here were very expensive and would have been seen as a great luxury.